1) When talking to other limo companies, ask them what percentage of their business is for weddings. (Ours is 96%) Ask them if they actually own the cars or are they booking them from another company. 2) Specifically ask them if they charge extra to go take pictures somewhere between the church, venue or hotel. Also ask them about the cost of extending or changing the times that evening, and any extra charges for changing of clothes, unscheduled stops or cruising around enjoying the evening until the time is up. These are very important questions you need to ask in order to avoid very unpleasant, unexpected and expensive last minute surprises. (One Limo company charged the groom $90 extra for an unscheduled stop to use the restroom at a convenience store on the way to the hotel). 3) Our policy is to do whatever you want during the time you have the car rented. 4) FREE PHOTO SHOOT. If you pay to rent one of our cars for your wedding, we will give you a free one hour photo shoot at our office which has a wooded area behind the building. This can be for a save the date photo or bridal portrait before the wedding or for your "First Christmas Together" card after the wedding. You can also use a different car from the one you rented. You can bring your photographer or hand us your phone and we will snap the picture. 5) WHY USING THE SILVER BENTLEY MIGHT BE THE BEST CHOICE. In any wedding picture, the bride's dress should stand out. A white dress against a white car will not be the best contrast for the wedding dress. Using a black limo, the groom's tuxedo would not stand out. 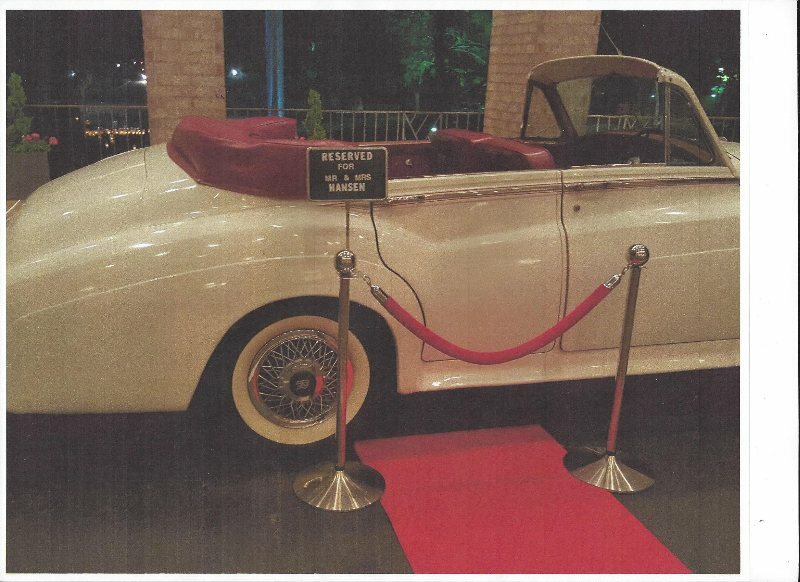 SOLUTION: The silver 1960 Bentley for the ideal backdrop for the bride AND the groom. 6) INFORMACION EN ESPANOL? En cima de este pagina, marque "Select Language", entonces marque Spanish y todas las palabras en todas las paginas cambiaran a Espanol. Boda Catolica? Podemos recoger a la novia y su padre e ir a la iglesia. Despues de la Misa podemos ir a Hermann Park o en algun lugar cerca para sacar fotografias y luego a la sala. Cuatro horas, precio total $1250 mas 15% de propina para el chofer..
7) GETTING THE BEST PRICE. Have your wedding on a Friday or Sunday. Bundle the runs, use the Trolley for your guests and the bachelorette party and rehearsal dinner. Ask a family friend or relative to "Sponsor" the limo instead of buying you a wedding present. pleasant or comfortable for older relatives or bridesmaids in tight dresses. not the number of trips and we will go back to the hotel for one guest, if requested. 8) WHY USE A VINTAGE LIMO IN THE FIRST PLACE? Think of the moments anyone would have in their lifetime that define them, the events that were so profound and so few that they can be only be counted on the fingers of their hands, those that stand out as milestones or important rites of passage. Perhaps graduating from High School or College, winning a prestigious award, being promoted to a very high position in your company, being sworn in as an officer or enlisted man in the military, having your first baby and, of course your wedding day. Go ahead, ask your grandmother to tell you about her wedding day, and then be prepared for a several hour discussion of every minute detail of that day 60 years ago. We have on a few occasions taken a mother and her newborn baby home from the hospital in the Rolls Royce with the baby's name on the front license plate. When we arrive at the house, we back in the car in the driveway and the couple stands by the car holding the baby and we take that picture with their cell phone. When the baby is old enough to understand things, the parents explain, "We wanted to be able to show you someday how absolutely special you are to us that we rented a Rolls Royce to bring you to the home you would grow up in and cherish the love and joy we all have for each other as a family. Rolls Royces are only used by very special and accomplished people. We expect you to do great things in your lifetime so that someday you will be able to own or ride in a Rolls Royce on some memorable occasion of your own". Here's one of my stories . It was my mother's 85th birthday. I wanted it to be special as she was in her twilight years. I picked her up at home in the Rolls with her first name, Rosalie, on the front plate. We went to Vargo's where I knew they would let me park it by the front door. We had a very nice dinner looking out at the swans in the adjoining lake and the Azaleas were all in bloom. I had pre-arranged the event. At the end of the meal, the waiter, a very large black man in a tuxedo came to the table and in a booming voice like Barry White, slowly sang "Happy Birthday dear Rosalie" and then handed her a piece of carrot cake (Her favorite) with one candle. She had tears in her eyes. The other people in the restaurant stood up and applauded. On the way out, the manager opened her door and also wished her Happy Birthday. I consider myself unbelievably blessed and fortunate that I was able to pick her up and take her home in my Rolls Royce. (Mothers like to brag about how successful their children became). My mother sacrificed a lot over the years and had to endure many times when I am sure I tried her patience. It was my turn to say "Thank You" in a small but very memorable way. Some time ago we had a bride call us from Alice, Texas. (An hour and a half on the other side of Corpus Christi). She wanted to know if we could bring the Rolls Royce down there for her wedding. I said, "Well yes that is possible, but we would need to load it on a truck and trailer and charge you for the time it took us to get down there and then drive back to Houston, it would be rather expensive". She said, "I don't care, ever since I was a little girl, I have dreamed of having a white vintage Rolls Royce for my wedding. For me, it's the most important part of my wedding planning". Well, we couldn't break the heart of a little girl, so of course we did the wedding and she was thrilled. It's times like these that we know why we are in this business. How about your wedding? How special do you want it to be? We know that everybody has a budget and different things have different priorities to different brides. 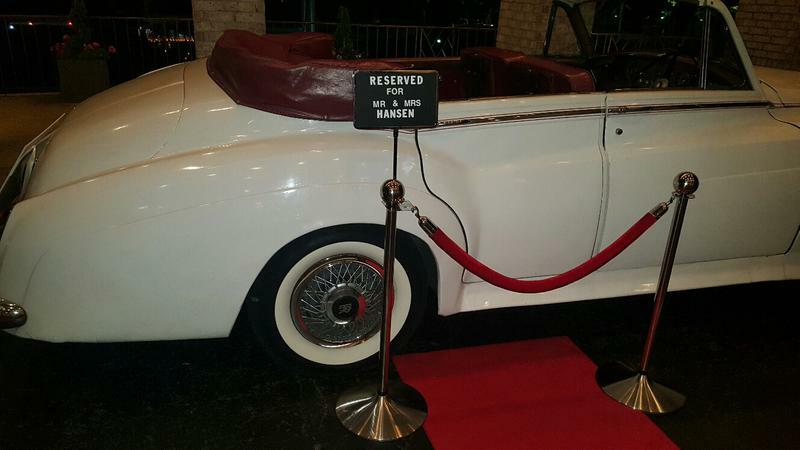 Sometimes a bride or a groom will surprise the new spouse with one of our Rolls or Bentleys. 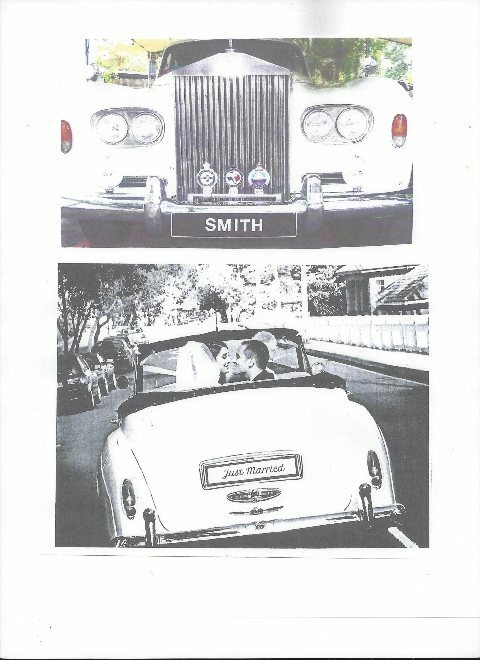 We have had brides break down in tears when they come out of the church and the see the Rolls with a red carpet, a sign that says "Reserved for Mr. and Mrs. "Smith" and the chauffeur standing by the back door with cap and white gloves at Parade Rest. (If that doesn't communicate "I think you are super-special, what does?). I am sure you have spent many hours and precious dollars on flowers, table decorations, special hors d'oeuvres, bridesmaid and groomsmen gifts and they will be very touching and beautiful. Five years from now, what are your guests most likely to remember? If you leave the reception in a vintage Rolls Royce or Bentley with a Just Married sign on the back and the two of you looking out the back window waving goodbye, I can assure you that is something that will be etched in their memory for all eternity. Like the parents bringing their newborn baby home from the hospital, as you leave in the Rolls, you are indirectly saying, "This is a very special moment in our lives and we want to start out in our journey of life as a married couple riding in a car that is advertised as "The best car in the world". (No other car company has ever challenged that claim). In summary, if you want to create those special memories that absolutely take your breath away, one of the moments you can count on the fingers of one hand, moments when you have never felt more alive, moments like the ones in Barbra Streisand's song, "Misty water colored memories that light the color of my mind". Would you like one of those kind of memorable moments? If so, we have the cars to make them happen. 9) FREE DOWNTOWN PHOTO SHOOT. If your wedding or reception ends near downtown (Hotel Zaza, Icon, Hyatt, Marriott, Magnolia, etc. ), we can take you to our secret location where we park the car and the two of you stand by it. You hand us your phone and we take a picture of you with the downtown skyline in the background. Other limo companies would refuse to do this and/or rip you off $250 for an "Unscheduled Stop". We will be glad to do this for you at no extra cost because we are dedicated to help making your wedding day special, memorable and romantic. That's who we are; that's what we do. 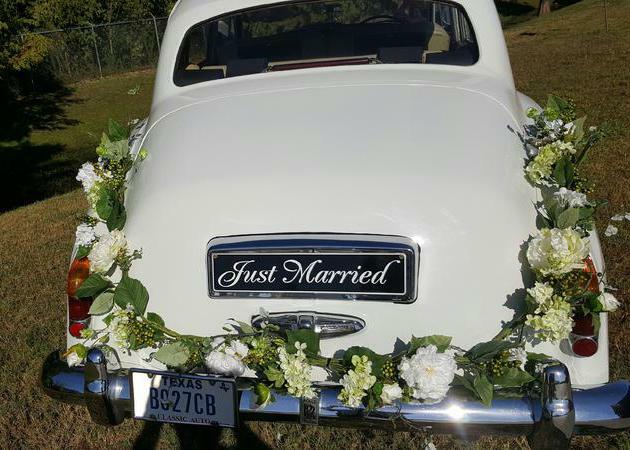 Please visit the vehicle page on this website and click on the "More Pictures" links for the vehicles you may be interested in to see pictures from other weddings and to get some ideas for yours. Rolls Royce or Bentley for your wedding. so you can enter the car. There is a sign that says "Reserved for Mr.
for this package $180. (This package is for the signs and the Red Carpet. 1) THE SPLIT-RUN COMBO. One of our most popular packages. Use the air conditioned white 1965 Rolls Royce Princess hard top for the transfer from the church to the venue, then at the end of the evening, do the final getaway in the white 1963 Rolls Royce convertible. Total price $1350-$1650 plus 15% gratuity depending on locations and times. 2) THE PRISSY-MISSY PACKAGE. Some brides will adamantly refuse to ride in a convertible because their hairdo may get wind-tussled, even though the wedding is over. With this package, you use the convertible for the pictures and the getaway, cruise around for a few minutes, then get in a regular stretch limo or SUV for the actual ride to the hotel, a surefire bride pleaser for even the most finicky bride. Added on to option 1), the extra charges would be an additional $300-600 plus 15% gratuity depending on locations, times, etc. a) Stretch limo or SUV for the bride and bridesmaids on the wedding day, 10:00 AM to 4:30 PM, for beauty salon, spa, makeup, hairdresser, ladies' brunch, etc. b) Rolls Royce or Bentley takes the bride and her father (Or whomever she chooses) from the house/hotel to the church. The bride and groom leave the curch in the same vehicle to go on to the reception. The maiden name would be on the front license plate for the trip to the church and the new married name for the trip to the reception. c) Final Grand Getaway. The bride and groom glide off in wedding bliss in the back seat of the white 1963 Rolls Royce Convertible, gazing fondly and waving goodbye as they look over their shoulder. The Oscar Night Red Carpet Package is automatically included and the couple gets to keep all three name plates at the end of the evning. Priced separately, all this would come to $2797. Total price for this package $2395 plus 15% gratuity. (Out of area and seasonal rates may apply). 3a) THE MODIFIED QUEEN FOR A DAY PACKAGE (No late night getaway). a) Stretch limo or SUV for the bride and bridesmaids on the wedding day, 1:00 PM to 6:00 PM, for beauty salon, spa, makeup, hairdresser, ladies' brunch, etc. b) Rolls Royce or Bentley takes the bride and her father (Or whomever she chooses) from the house/hotel to the church. The bride and groom leave the curch in the same vehicle to go on to the reception. The maiden name would be on the front license plate for the trip to the church and the new married name for the trip to the reception. A photo shoot with your photographer or cell phone at Hermann Park or the skyline bridge is included. Oscar Night Red Carpet Package included. Total price $1995 plus 15% gratuity. 4) THE ROLLS ROYCE GOLF CART/ROLLS CONVERTIBLE COMBO. Ideal for a country club wedding reception. The couple leaves in the golf cart (As a joke), circles around, gets out and then the real Rolls Convertible comes up and takes them away. $1195 plus 15% gratuity. (Out of area and seasonal rates may apply). 5) THE PICKUP/DROPOFF. The getaway from the reception to the hotel only. Priced attractively from $495 to $950 plus 15% gratuity. Monday to Thursday evenings downtown to Galleria would qualify for the cheapest prices. Saturday nights are the most expensive. Prices tend to be lower in January and August. Fridays and Saturdays during Wedding and Prom Season will be very high. The cars also have different prices. If you choose a quaint, rustic absoluely charming reception facility that is several counties away on narrow unlit two lane roads way out in the boondocks forty miles from nowhere, that price will be higher than a close-in location inside the Loop 610. Sometimes paying up front in full several months in advance may get you a better price. 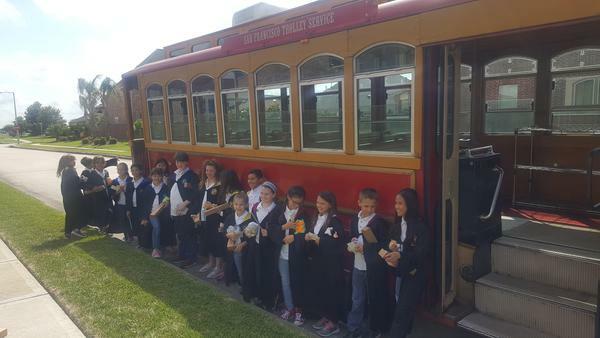 If you also book the Trolley for the rehearsal dinner or guest shuttle in addition to a Rolls, that can get you a lower combined price. Limo prices, like airline tickets, will become more expensive as the date approaches. Better to book early and save. 6) THE VANILLA DOUBLE SCOOP ICE CREAM CONE PACKAGE. Two white Rolls Royces (Double scoop). The white 1963 Rolls Royce convertible arrives for your grand getaway. As you leave, you do the princess wave (Elbow, elbow, wrist, wrist, touch your pearls, blow a kiss). After the thrill of the best getaway possible fades, the night air might seem a little muggy or extremely chilly. Not to worry. After going a few blocks, you transfer to a white 1965 Rolls Royce Princess hard top, air conditioned. The absolute perfection of a born-free convertible grand exit with the comfort and luxury of an identical car (But with a hard top) with all amenities for the ride to the hotel. One hour, $1450 plus 15% gratuity. 8) Trolley for Kid Birthday Party. Themes could be Star Wars, Harry Potter, etc. The Trolley is used to drive the kids around while the parents re-set the stage inside the house for the next episode of the "Play". This is available on Sunday afternoons after 2:00 PM or Sunday-Thursday anytime when school is out.Full wedding prices would apply for Fridays or Saturdays. Call for pricing. Holiday and out of area fees may apply. 9) The Grand Entrance (As opposed to the Grand Getaway). We have had the situation where guests start leaving before the end of the reception and the bride panics and calls us and asks if we can get there two hours early so the guests can see the car. (Usually we can't). Here's the solution: No guest will ever leave until after their free meal. 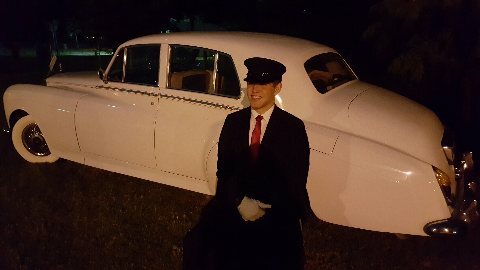 So, either use the car from church to reception, or if the ceremony and reception are on the same site, have all guests go into the hall for the cocktails while you do the family pictures in the chapel. Then, have everybody lined up just like you would do for the getaway and the Rolls or Bentley or Convertible glides up to a pre-positioned red carpet (Just like at the Oscars) and you gracefully wave and make your way into the hall as the crowd cheers wildly. Done deal, mission accomplished.